Christmas is coming soon, now is the time to plan that special activity, craft, or Bible lesson. This page lists some of the most popular resources on our website related to Christmas. Be sure to check back, we will be adding new content to this page leading up to Christmas. In A Hurry? Then browse only our 5 most popular Christmas resources. Over the past few years, we’ve posted a large number of Christmas lesson plans. These free materials are easy to print and have been used by thousands of churches. They include both Kids Church and Sunday School lessons. You will find a variety of teaching styles represented, so browse them all and find what works best for your ministry. Like all our content you are welcomed to modify them to best fit your needs. Don’t overlook the printable Christmas Story Booklet and The 12 Symbols of Christmas. These can supplement any of the lesson plans or be used on their own to teach kids about the birth of Jesus. We also have free Christmas thank you card sheets for children. We’ve uploaded a printable acrostic poster to teach through the names of JESUS. This is a new resource for Christmas 2010. Mandy Groce has created an original Advent coloring book. Each of these coloring pages shows a different aspect of Christmas with the phrase “Because of Jesus we have ….” This is a fun way to remind kids about the real meaning of Christmas. When all put together, kids will have a Gospel-centered art project in to celebrate the season. There are a total of 6 coloring pictures in the series, all 100% free for you to download and print. 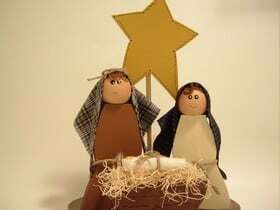 Free Christian Craft Ideas for Christmas – This page links to several high quality craft ideas on other websites. Happy Birthday Jesus Coloring Sheet – This is a super easy coloring page perfect for a Jesus Christmas card or Birthday party. Where to find Christmas musicals for kids at church? Forum: What To Get Ministry Volunteers For Christmas? What does Santa Claus have to do with Jesus? Are Christmas Gifts Dangerous For A Child’s Soul? How to write a Christmas Sermon – some great hints that apply to teaching kids too. Thank you. I have been fishing around trying to find something suitable for my class of 7-12 year-olds which meets once a month. I have just recovered from an operation and ready to go. All the material listed from you is just what I needed. Thank you. God’s blessing on you and your ministry. Thank you every body who contributes to this website. I need a quick/easy/low maintenance Christmas idea, and you have blessed me with more than ONE! Our childrens ministry has about 30 kids a week, but different kids every week. These are also busy kids, so the less rehearsing, the less hassle, the better. its also my first year in the job. Especial thank you to the author of those two items. Thank you so much. An everyday inspiration to my sunday lesson for my Kids in Church.